The purpose in this study was to evaluate 2 signs in hysterosalpingography (higher position of one or both tubes and S or C shape course of one or both tubes) in the prediction of endometriosis. El-Shatby Maternity University Hospital, Alexandria University. Eighty six infertile women who were assigned to do laparoscopy. 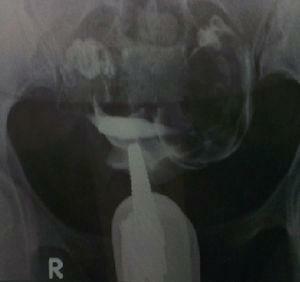 Hysterosalpingography was done within 3 months period before laparoscopy. Evaluation of the position of both tubes and S or C shape course of the tube. Laparoscopy was done with documentation of all findings including the presence of endometriosis with biopsy from atypical lesions. All the above signs show high specificity in the prediction of endometriosis although only 2 signs (higher level of left tube and bilateral tubal S or C shape) showed high sensitivity in prediction of endometriosis. Careful examination of the HSG film and searching for the specific signs of endometriosis is a practical and simple method in prediction of endometriosis. These preliminary data suggest that HSG has a role in the prediction of endometriosis. Avaliar dois sinais na histerossalpingografia (posição mais alta de uma ou ambas as trompas e forma de S ou C no curso de uma ou ambas as trompas) no prognóstico de endometrioses. Hospital Universitário-Maternidade El-Shatby, Universidade de Alexandria. O grupo de estudo consistiu em 86 mulheres inférteis com laparoscopia marcada. A histerossalpingografia foi feita dentro de 3 meses antes da laparoscopia, com avaliação da posição das duas trompas e a forma em S ou em C no curso da trompa. Por ocasião da laparoscopia, foi feita a documentação de todos os achados, inclusive presença de endometriose; lesões atípicas foram biopsiadas. Todos os sinais acima demonstram elevada especificidade no prognóstico de endometriose, embora apenas dois sinais (nível mais elevado da trompa esquerda e forma das duas trompas em S ou em C) tenham demonstrado alta sensibilidade no prognóstico de endometriose. O exame cuidadoso das imagens da HSG e a busca por sinais específicos de endometriose são métodos simples e práticos para o prognóstico dessa doença. Esses dados preliminares sugerem que HSG pode ter utilidade no prognóstico da endometriose. It is difficult to estimate the actual prevalence of endometriosis in infertile patients and it was hypothesized to be as high as 50% affecting the peritoneal and tubal factors.5,6 Fallopian tube abnormalities are one of the most common causes of female infertility.7 The tubal abnormalities could be diagnosed by hysterosalpingography which include patency, irregularity, peritubal disease and obstruction. The ability of HSG to diagnose the underlying pathology is limited for absence of pathognomonic signs for different pathologies.8 Prediction of endometriosis using HSG has been tried before but with no clear signs developed to diagnose the disease until now. Lack of association between endometriosis and HSG, pushed us to investigate and look for novel signs in that old procedure to revive its importance and provide a new insight in an a traditional investigation. One tube higher than the other (specify right or left tube) by drawing a transverse line over the fundus and documented the actual position of both tube. Coiling of one or both tubes so that a C or S shapes could be identified, and specify which tube. Any additional observations were documented include tubal obstruction, out-pouching, hydrosalpinx and peritubal adhesions. The normal positions of the tubes depend on the relaxing nature of the tube. The tubes during the HSG are prolapsed backward as the patient in the supine position. Any change of the mesosalpinx could change the position of the tubes. The higher level of the left tube is explained by the prevalence of the endometriosis more on the left side of the pelvis and around the sigmoid due to peritoneal scarring. Endometriosis can cause macroscopic and microscopic scarring and shortening of the mesosalpinx especially in the distal part of the tube. This shortening could lead to limited mobility of the tubes thus when filmed during HSG, while the patient is lying supine, it appears at higher level than the fundus. On the same time, this shortening makes the mesosalpinx so tight that the tube becomes coiled to fit into its narrow peritoneal covering and this can give the C or S shaped coiling. These signs are considered as a fingerprint of endometriosis and its long term effect on the peritoneal surfaces. This explanation does not depend on the stage of endometriosis as it was found to be associated also with stage 1 and 2 as in stage 3 and 4, the adhesions are very dense and could be diagnosed by ultrasound or other imaging techniques. Moreover, these findings could appear away from the actual endometriotic lesion or adhesions and this particularly is considered as an advantage for possible prediction of subtle and early stages of endometriosis. Interference of the position of the uterus in retro- or ante-version and the angle of the X rays was solved by maintaining traction on the vulsellum during injecting the dye and during taking the films. The examination of the HSG was done in different day of the surgery. Laparoscopy was done for all the patients after obtaining patient's consent in the immediate post menstrual period. Endometriosis was staged at laparoscopy using the revised-American Fertility Society.1,9 Typical, atypical lesions and sigmoid congenital adhesions were documented in the cases with endometriosis that was proven on histopathology to be endometriosis. The person who assessed the HSG and the laparoscopy were different physicians who assessed the HSG a day before the surgery with writing their comments and others performed the surgery on other day comparing the data at end of surgery regarding HSG data and operative data for each patient. The staging of endometriosis according to rAFS in all cases was minimal to mild as moderate and severe were excluded. If severe cases were included, the sensitivity of HSG may be overestimated. Sample size calculation: a minimum sample size of 65 achieves 80% power to detect a difference (P0−P1) of −0.1659 between the null hypothesis that the population proportion is 0.2000 and the alternative hypothesis that the population proportion is 0.3659 using a significance level of 0.05. The sample size calculations of 65 patients as a minimum number taking into considerations that the prevalence of endometriosis is ranged 20–36% with 80% power and 5% level of significance. The sample size calculated is by using the NCSS and PASS program. Sensitivity is the probability that a test will indicate ‘disease’ among those with the disease. Specificity is the fraction of those without disease who will have a negative test result. Positive predictive value is the probability that subjects with a positive screening test truly have the disease. Negative predictive value is the probability that subjects with a negative screening test truly don’t have the disease. The study group had a matched age with the mean age of 28.8 years. Nulliparous patients were 53.5% of cases and the multiparous patients were 46.5% of cases. Mean year of infertility was 4.9 years. Positive cases of endometriosis were 36 cases (41.9%) and negative cases were 50 cases (58.1%). Cases with higher level of the left tube were 40 cases (46.5%) (Fig. 1). This sign had significant Pearson correlation (p was 0.004). Cases with higher level of the right tube (Fig. 2) were 5 cases (5.8%). Cases with higher levels of both tubes (Fig. 3), were 5 cases (5.8%). Cases with C or S shaped tube were 6 cases (7%). Cases with bilateral C or S shaped tubes (Fig. 4) were 44 cases (51.2%) and this sign had significant Pearson correlation coefficient (p value was 0.005) (Tables 1 and 2). HSG film shows higher level of the left Fallopian tube. HSG film shows higher level of right Fallopian tube. HSG film shows higher level of both Fallopian tubes. 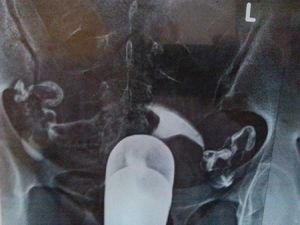 HSG film shows bilateral C or S shape of both Fallopian tubes. The five signs with the number of positive cases out of total (n/N) with % between brackets for the HSG (test under study) and laparoscopy (reference test) followed by Pearson Chi-square and P value. ‘Higher left tube’ and ‘Bilateral S or C tubes’ with sensitivity, specificity, PPV, NPV, LR (+) and LR (–). Confirmation of the laparoscopic findings was done including position, shape, patency, presence of S or C shape of the tubes and presence of endometriotic lesions (Figs. 5 and 6). Higher position of the left tube (laparoscopic view). S–C shape of the left Fallopian tube (laparoscopic view). Typical, atypical lesions and sigmoid congenital adhesions were documented in the cases with endometriosis that was proven on histopathology. The normal positions of the tubes depend on the relaxing nature of the tube. 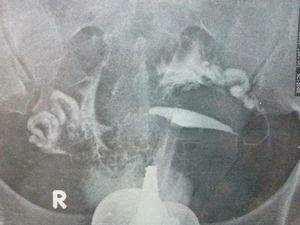 The tubes during the HSG are prolapsed backward as the patient in the supine position. Any change of the mesosalpinx could change the position of the tubes. The higher level of the left tube is explained by the prevalence of the endometriosis more on the left side of the pelvis and around the sigmoid due to peritoneal scarring.19 Endometriosis can cause macroscopic and microscopic scarring and shortening of the mesosalpinx especially in the distal part of the tube. This shortening could lead to limited mobility of the tubes thus when filmed during HSG, while the patient is lying supine, it appears at higher level than the fundus. On the same time, this shortening makes the mesosalpinx so tight that the tube becomes coiled to fit into its narrow peritoneal covering and this can give the C or S shaped coiling. These signs are considered as a fingerprint of endometriosis and its long term effect on the peritoneal surfaces. This explanation does not depend on the stage of endometriosis as it was found to be associated also with stage 1 and 2 as in stage 3 and 4, the adhesions are very dense and could be diagnosed by ultrasound or other imaging techniques. Moreover, these findings could appear away from the actual endometriotic lesion or adhesions and this particularly is considered as an advantage for possible prediction of subtle and early stages of endometriosis. The prediction of endometriosis can save a long time, anxiety and unneeded investigations. This prediction can be used in proper counseling and to help in giving more appropriate fertility advices. In conclusion, careful examination of the HSG film and searching for the specific signs of endometriosis is a practical and simple method in prediction of endometriosis. These preliminary data suggest that HSG has a role in prediction of endometriosis. Endometriosis and subfertility: is the relationship resolved?